WATERBURY – If there’s anything that can be said about school bus driver’s and others at All-Star Transportation, it’s that they care about their community and their co-workers. And they are more than willing to take lend a hand when action is required. In September, when the extent of the devastation in Puerto Rico following Hurricane Maria became known, drivers and monitors in Waterbury got busy. They reached out to their local state representative, Geraldo Reyes, and spent a Saturday raising money and collecting goods at two locations in Waterbury. 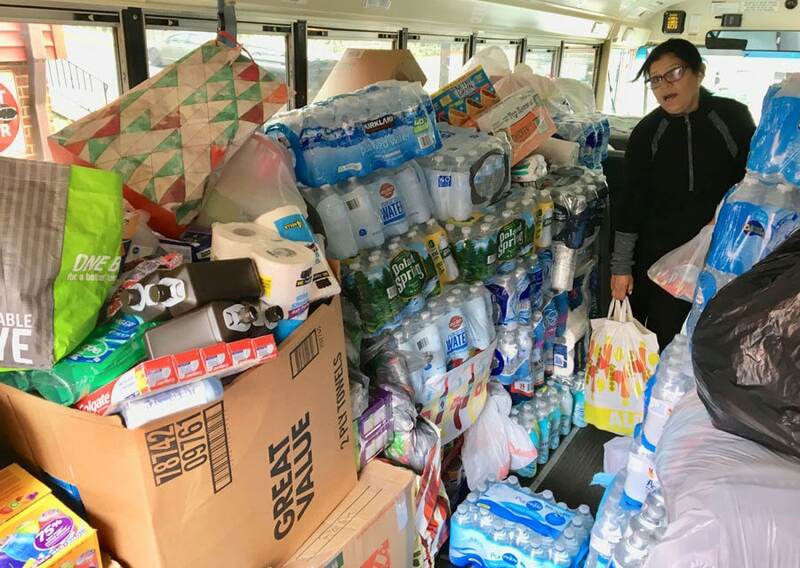 They raised $4,200 in cash and filled two buses donated by All-Star with a variety of goods. Reyes, a Democrat representing Waterbury’s 75th District, said he was first approached by Mayra Alejandro, a driver/trainer in Waterbury. The Reyes and Alejandro families have known each other for years, Reyes added. 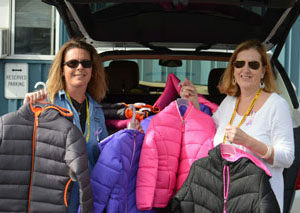 Leslie Sheldon delivers coats donated to the Plymouth food kitchen to Manager Sherry Hoag. “She said she wanted to continue the efforts started by other people,” Reyes said, explaining that fund-raising efforts had popped up all over the state and a group of Latino state legislators had banded together to raise $100,000 for hurricane relief. “I don’t know all the drivers and others from All-Star Transportation, but they were outstanding. They really stepped up,” Reyes said. “They worked hard and a lot longer than I thought they would. They worked two shifts at two locations in the morning and afternoon. To date, $11,000 has been raised in Waterbury, with the bulk of that resulting from the efforts of the All-Star team, Reyes said. The goods that have been collected are stored in a warehouse, waiting for a time when the items can be safely shipped to Puerto Rico. In another recent case, staff at the Plymouth terminal collected 60 coats to help the Plymouth Community Food Pantry in its annual drive for winter coats for the needy. The staff collected 30 coats and All-Star Transportation matched that total by purchasing 30 new coats that it donated to the coat drive. “We’re so appreciative. We collected twice as many coats as last year, mainly thanks to you guys,” said Erin Kennedy, director of the food pantry. 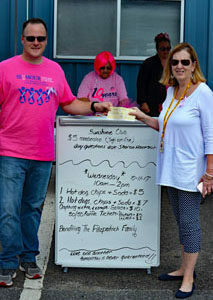 Seymour Manager Steve Gardner accepting a check from Leslie Sheldon, operations manager. Throughout the year, All-Star drivers donate their time to a variety of charitable efforts, and on many of these occasions All-Star also loans one or more buses to provide transportation support. Earlier this year, All-Star went a step farther, donating a new bus to the Waterbury Police Activity League (PAL). The bus has a unique design featuring a colorful collage of photographs taken during PAL activities. The interior is specially equipped with storage racks that make it possible for kids to safely stow their equipment while traveling. The bus also uses propane fuel, making it an environmentally friendly form of transportation. “When everyone works together, good things happen. When good things happen, the corporate community notices and steps up,” said Waterbury Mayor Neil M. O’Leary, as he praised All-Star’s contribution. Of course, All-Star employees are always ready to help one of their own when battling a personal illness or coping with an unexpected tragedy. Such was the case in Seymour, where the Alyssa Fitzpatrick, the seven-year-old daughter of Seymour driver, Krystle Fitzpatrick, died suddenly. The entire All-Star family came together to support the Fitzpatrick family, holding hot dog and bake sales, and launching a Gofundme page that collectively raised more than $11,000. “When we are confronted with real tragedy or real need, we can ignore it or we can react. At All-Star Transportation, our nature is to do something to help, and we do that because it is the right thing to do,” Sheldon says.